Looking to enhance or improve your ping pong game experience? Did you know that the paddle has an effect on your performance? Well, the paddle you use has a lot to do with your output and experience during play. As a result, it is important to be equipped with a paddle that takes care of the important dynamics of the game for a wonderful play. The Killerspin jet 800 offers exactly this and is the Ping-Pong paddle to go to be it for recreational, training or professional use. The paddle features top of the range specifications and has some great reviews from the current users as well as the experts in the field. 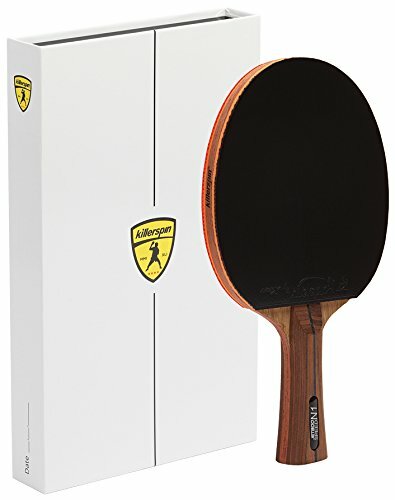 As a matter of fact, it is also worth noting that the Killerspin jet 800 is the most sophisticated table tennis paddle from the range of premade paddles from Killerspin. This Killerspin jet 800 Review will detail all you need to know about the paddle including the features, pros, and cons. The Killerspin jet 800 brings a sense of class to the Ping-Pong game with great style and appeal. In addition, it comes with a matching packaging that makes it qualify as a gift item worth the impression and recognition. Thus, if you have a friend or family member who is into Ping-Pong, this would be a great gift item. The blend of colors and the iconic logo on the paddle makes it stand out from any other and brings instant recognition at first sight. The handle brings out the elegance of the paddle being made from burnt wood and featuring asymmetric design. The Killerspin jet 800 being at the top of the range for the paddles made by the manufacturer guarantees a professional touch. As a result, you stand to get a more pop and spin when using the paddle.This is a big game changer when it comes to the overall playing experience. For those in competitive gaming, this could really mean a lot as this gives you an advantage over the opponent. At the same time, when used as a training paddle, it allows the user to learn more moves with ease. This, as a result, gives a better overall performance and a gateway to professional playing. The Killerspin jet 800 is designed to be a professional paddle and being at the top of the range of the products offered means a lot. Despite it coming with cutting-edge features, the paddle is available at a price that makes it accessible. As a result, it is possible to use it as a training paddle or even for competitive gaming if you are at that level. As a matter of fact, the paddle’s specs are in line with the recommendations of competitive paddle designs. With this paddle, you thus have a chance of playing like a Pro irrespective of your current level. The paddle is made using the leading carbon technology making it strong, durable while at the same time light enough to ensure the perfect spin. The two layers made from the composite material together with the infused 7 layers of wood ensures that the paddle has aggressive shots. With the aggressive shots and the amazing returns, the feel of the game is amazing. For maximum protection of the internal parts and see to it that the paddle last long, it features a blade protection technology using a wooden side tape. The tape also adds to the overall appeal of the paddle and makes it look compact. Comes with top quality rubber for extraordinary grip and high tension. Features a 7-ply technology making the paddle ideal for aggressive attacks. Has a flared handle that is ergonomic and allows for an excellent grip and is a perfect fit for all hands. Includes carbon composite materials for extra strength and a lightweight feel. Has a wooden side take for the protection of the blade. The paddle is affordable thus making it ideal for a variety of uses from training to competitive gaming. Lightweight design is yet strong for better spins and more pop. Allows for a feel of competition level paddle. High quality builds with a touch of class. Top rated speeds for aggressive attacks. There have been some reports of some fish-like smells in the initial days of use. Reports have been made that the paddle might snap in two though this has been disputed by experts from experience. Some players are indicating that they find the paddle heavy perhaps due to the 7-ply technology. Q. Do you need to buy edge tape for the paddle? A: The paddle does not need to require an edge tape as it already comes with a tape from the factory. In fact, the paddle comes with a wooden tape that is not only strong but also fully functional. Q. Is the paddle fit for competitive gaming? A: The Killerspin jet 800 is a top of the range paddle that is designed for competitive and professional gaming. It is also worth noting that it is ITTF approved. Q. Can I replace the rubber? A: Yes, the rubber can be replaced and still the paddle can be expected to work fine. Getting a paddle that will offer a perfect match on the expectations of the users is quite a challenge. This is not only when it comes to the purchase of paddles but also any sporting equipment. However, with the info about the Killerspin jet 800, it is pretty convincing that this is the paddle to go to. The combination of being in a position to undertake a number of functionalities is also a big plus and further making the paddle desirable. Nevertheless, the final verdict lies with you, but with the details listed above, the decision-making process will be much easier in determining whether or not this is the paddle for you.